10am, Rome: Applied Double Wear Stay-in-Place Concealer (shade 2, light/medium) to both undereyes, patting in with fingertips. Hangover level: 8/10, hours sleep: 3, Number of alcohol units still in system: 65. 8pm, Northern Italy, minibus: playing iPhone scrabble: rubbed at eyes quite a lot due to tiredness, low lighting in minibus and general boredom. 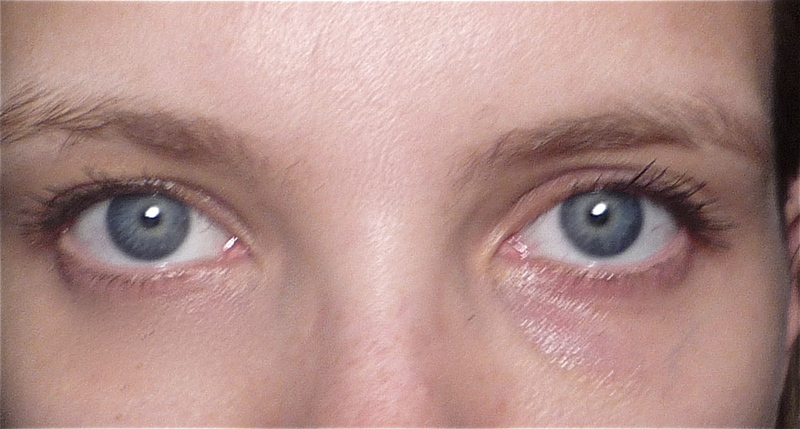 11.55pm, Nice, France, hotel: Removed concealer from one eye only to compare and contrast. Check out the bad eye! I look as though I have myxomatosis! The other eye looks pretty good, considering that I had applied the concealer fourteen hours earlier – this stuff really is ‘Stay-in-Place’. I think that I put it through quite considerable wear, and it lasted amazingly well. 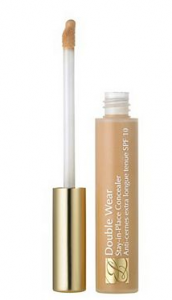 If you’re expecting this concealer to be a thick, heavy-duty formula then you’ll be pleasantly surprised; it’s light and creamy and easy to apply by just dotting a tiny amount of product on with the wand and patting in with your fingertips. As demonstrated by above photo (I still can’t believe how shocking my ‘un-concealered’ eye looks), Double Wear works like magic on dark under-eye circles, fading them away completely and blending perfectly without sinking into lines and creases. I can’t think of a negative to write about, but if I could offer a tip: you only need the tiniest amount of product. If you’re unsure, dab a small amount of concealer on the back of your (clean!) hand, and use your fingertips to pat it on from there. Next Post Topshop Eye Crayon in ‘Sun Shower’.